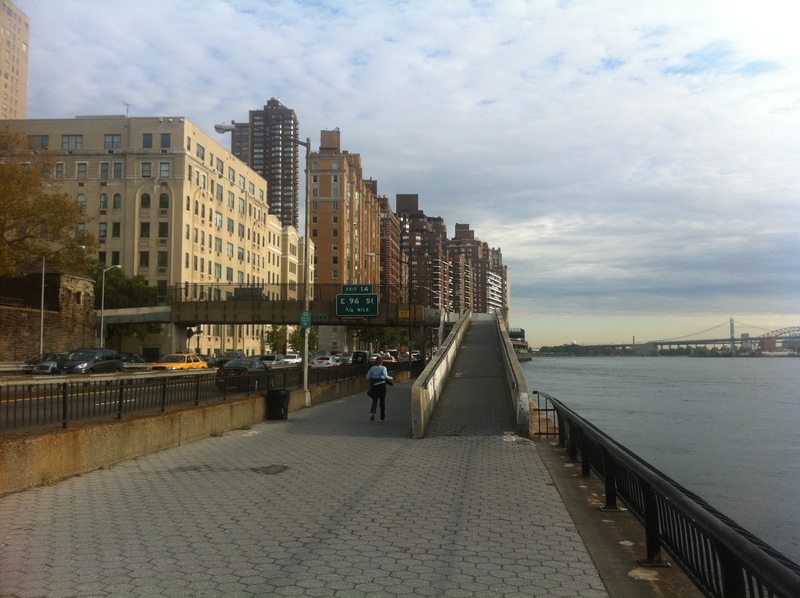 Bridge over the FDR Drive, with field construction starting on or about October 18, 2010. The project is expected to be completed in August, 2011. Close the sidewalk on the south side of East 78th Street between the FDR Drive and Cherokee Place; Remove the parking along the south side of the street; Create a work zone for construction staging on the south side sidewalk and south side parking lane; Remove the parking on the north side of East 78th Street between the FDR Drive and Cherokee Place; Use the north side parking lane as a single lane for westbound traffic on East 78th Street; Close the bridge and the ramps on both sides of the bridge to the public; Pedestrians and bicycles will be redirected to the East 71st Street and the East 81st Street Pedestrian Bridges, for access to the Esplanade during the construction period. 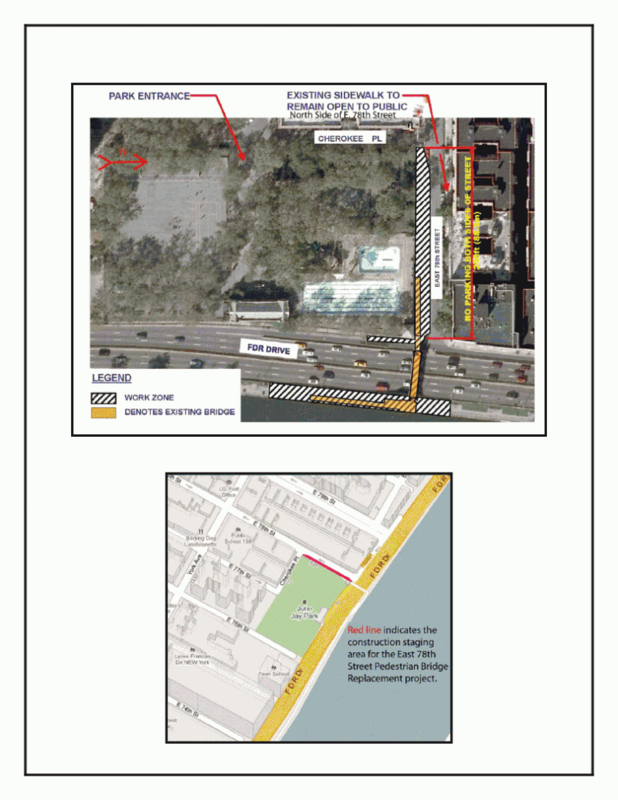 Questions regarding the lane and sidewalk closures, or the project in general, may be addressed to the Community Liaison, Deborah Howes at 347-834-7455 or E78thStreetPedestrianBridge@gmail.com. You may also call 311. Please be prepared to give your name, your borough, and the project number HBMC029R to be correctly routed to the project management team. The bridge is literally falling apart but one can’t help question the timing of its replacement. The East 81st Street Bridge just a few blocks up river has long presented a bigger obstacle for East Side cyclists. The current 81st Street Bridge consists of a 3 tiered stairwell that forces cyclists to dismount and carry their bikes up or down 3 flights to get back on the Greenway. Combine that with the path’s overall bad condition (and growing amount of sink holes), it’s easy to see why so many are discouraged from even taking the Greenway in the first place. The construction, though needed, will unfortunately severely restrict the present usability of what little East River Greenway there actually is. Greenway users will be forced to detour off the esplanade and around the project site by using either the East 71st Street or East 82nd Street access points. The current path already ends at East 60th Street to the south and East 120th Street to the north. I can”t expect too many riders/runners/walkers will want to deal with even more detours after already encountering them along the route through East Midtown and/or Harlem. Most users will probably forgo the greenway detour headaches and just use the heavily trafficked and often unsafe 1st/2nd avenue corridor to make the trip north and south. Talk about timing: the spotlight on the lack of protected bike lanes through the area has just gotten brighter. NYCDOT should work to minimize any interruption to the contiguous use of the East River Greenway by utilizing intelligent project staging and posting clear signage along the Greenway so (1) users know that the Greenway will remain impassable at East 78th Street for the duration of the construction project and (2) will be able find the appointed detour route in a safe manner.